Editor’s note: Today’s post comes from Sasha Bartashnik, zulily’s Marketing Analytics Manager. zulily is a $1.6 billion fast-growing e-commerce company that launches 100+ new sales a day to surprise and delight women with the thrill of discovering new and unique finds. This is part one of a two-part series. Every day zulily launches more than 9,000 product styles and 100 new sales, converting thousands of customers and processing millions of user actions. As a company with a customer first mindset, we’re always seeking to better understand our customers and optimize their experience. With so much data streaming in from internal and external sources, quickly accessing the data necessary to making marketing decisions was getting complicated and time-consuming for the average business user. As a result, analysts were spending more time writing code to answer ad hoc data requests than providing true actionable insights to drive the business. We needed to find a way to reduce the time it took to deliver the right message, at the right time, in the right channel, and to every customer. In order to do this, we created a self-service marketing analytics platform which makes use of the Google BigQuery integration with Tableau. For the first time, this platform gave us a single view of data across various marketing touchpoints including Facebook Ads, Google Ads, and email, allowing us to blend data with in-house sources such as clickstream, product catalog, and order transactions to make faster and better business decisions. This platform has made BigQuery and Tableau our marketing analytics team’s bread and butter—our custom implementation of these two technologies allows us to quickly analyze complex data and make recommendations to drive strategic, real-time decision making. This post will give you guidance on how you can apply some of the same strategies in your organization. Tableau is zulily’s reporting and visual analytics platform. 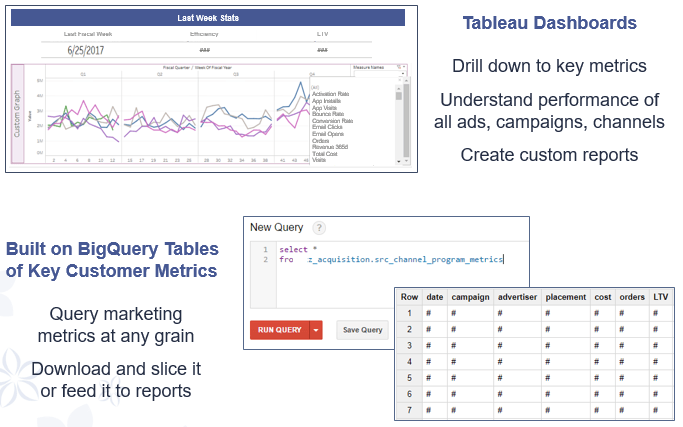 Marketing analysts and data scientists use Tableau for self-service analytics on data stored in BigQuery as well as to report insights from the aforementioned models. This helps us make real-time decisions every day, and offers long-term strategic insights. With all of zulily’s data now in BigQuery, we are able to build a robust machine learning model to predict customer lifetime value (LTV) using a variety of customer behaviors as inputs and tie the results to specific marketing campaigns to measure long-term performance. To accomplish this, we assign a historical lifetime value to find existing high value customers. We then use gradient boosting to consider over 1,000 transactional and behavioral variables and test hundreds of models. We eventually reduce to around 30 key features that are contributing factors for predicting the lifetime value of a customer. The end result is a model that can predict with very high accuracy the likelihood that a new zulily shopper will have a high lifetime value. We are then able to tie these predictions to marketing datasets living in BigQuery and provide the combined marketing performance data in highly dynamic and customizable dashboards, internally dubbed the Channel Metrics Dashboard (CMD), on our Tableau server. The CMD allows marketing channel manager and specialists to easily generate their own insights using historical and predicted data by selecting the metrics, date ranges, and even granularity they need by creating custom graphs and reports right on the server. This solution enables the zulily marketing team to quickly make decisions that optimize ads, emails, and offers towards customers who best respond to zulily engagements. When we moved over to this new data platform, we had a lot of help and support from both our zulily tech team as well as Google Cloud engineers and Tableau customer engineers. In part two of this series, this combined team will share tips and tricks about integrating BiqQuery with Tableau—stay tuned!